Wild salmon, king crab and halibut are hallmarks of Alaska cuisine. But another ocean product is increasingly making it way onto store shelves and dinner plates. It’s a sea vegetable called bull kelp—a salty, crisp plant packed with vitamins and nutrients such as calcium, iodine and iron. Bull kelp freshly harvested from the waters of Southeast Alaska. Photo courtesy of Barnacle Foods. A small but growing company in Alaska’s state capital, Juneau, is harvesting kelp from local waters and turning it into tasty products like salsa, pickles and seasonings. Barnacle Foods is owned and operated by Lia Heifetz, Max Stanley, and Matt Kern, who were born and raised in Southeast Alaska. The team started the company in 2016 with the goal of providing delicious, locally harvested and sustainable food. Their long-term vision is to create jobs and help Alaska boost its food security. “There are so many high-quality foods in Alaska. Our seafood, for example, is world-renowned for its quality and sustainability. But many of our foods are abundant for very, very short periods of time. We want to help play a role in harvesting and processing local ingredients and turn them into shelf-stable foods that are available throughout the year,” said Kern. Lia Heifetz and Matt Kern aboard their boat harvesting bull kelp. Photo courtesy of Barnacle Foods. Kern and Heifetz began experimenting with turning kelp into salsa in their own kitchen. The couple’s next step was to sell it at Juneau’s Public Market and Food Festival, where the product quickly sold out. That’s when they knew it was time to ramp up production and launch a business. To sell food commercially in Alaska, an individual or company needs a number of permits to ensure that their products are safe for human consumption. 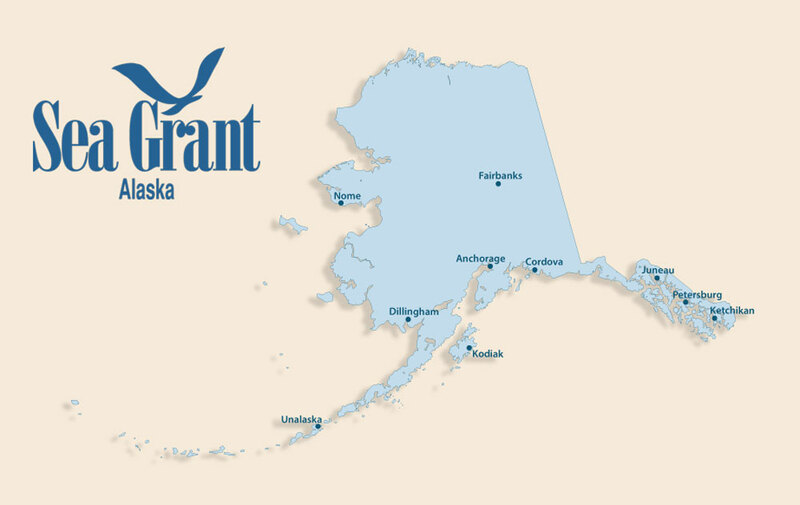 Heifetz and Kern turned to Alaska Sea Grant for help. Fireweed petals grace the tops of kelp pickles made by Juneau-based company Barnacle Foods. Photo courtesy of Barnacle Foods. A partnership between National Oceanic and Atmospheric Administration and the University of Alaska Fairbanks (UAF) College of Fisheries and Ocean Sciences, Alaska Sea Grant serves as one of Alaska’s process authorities, which means it can certify the safety of food production. When Barnacle Foods was developing its product line, the company would frequently send samples to Alaska Sea Grant’s seafood specialists. Seafood technology specialist Chris Sannito, an Alaska Sea Grant Marine Advisory agent based in Kodiak, along with Brian Himelbloom, retired UAF seafood microbiologist, would evaluate the company’s kelp pickles and salsa for pH levels and other factors. Sannito and Himelbloom also assisted with jar sterilization techniques. At the Kodiak Seafood and Marine Science Center, Alaska Sea Grant faculty tested kelp products by Barnacle Foods. Photo by Chris Sannito. “We look over the scheduled process the manufacturer intends to use. That’s the exact step-by-step process they follow to make their product as well as the specific ingredients they use. We make sure they’re doing it by established scientific schedules. We also ask for a final product to make sure the levels we’re looking at in the lab are the same as in their facility,” said Sannito, who works out of the Kodiak Seafood and Marine Science Center, which is owned and operated by UAF. Matt Kern and Lia Heifetz hold one of their company’s raw products: bull kelp. Photo courtesy of Barnacle Foods. Sannito has given Barnacle Foods a clean bill of health and is impressed with the products, both ingredients and labeling. “They have really nice packaging and the products look appetizing,” he added. Bull kelp floats on the water’s surface in Southeast Alaska. Photo courtesy of Barnacle Foods. The kelp products are currently sold online and in specialty food stores and gifts shops in Alaska. Barnacle Foods is also expanding its reach into the Pacific Northwest and California, including the New Seasons Market chain in Oregon and Washington, food co-ops in the greater Seattle area, and Bi-Rite Market in San Francisco. Kelp in a tote. Photo courtesy of Barnacle Foods. The company had earlier operated a mobile storefront in downtown Juneau out of a converted shipping container. But the lot it sat on is being developed, and Barnacle Foods had to move. For now, the owners are focusing on the wholesale business of selling to distributors and stores. DeeAnn Apgar, owner of Summit Spice &Tea, displays a variety of Barnacle Foods products, including kelp pickles, on her Made in Alaska table at her Midtown Anchorage shop. Photo by Paula Dobbyn. One customer in Anchorage is Summit Spice & Tea Company, a popular store and tea café in Midtown. Owner DeeAnn Apgar features a large table of Alaska-made products ranging from sea salt made in Sitka to Alaska umami sauce. At the center of the table, piled high, are stacks of Barnacle Food pickles, salsa and seasonings. “Alaska is so far away from the rest of the country. It’s hard to do farm-to-table here. But products like kelp pickles from Southeast Alaska certainly help bridge the gap,” she said.